I have accidentally become the unofficial locksmith for my family, as 3 of us now own ~century-old New England homes and have an interest in keeping the original door locks intact if possible, while still being able to lock our doors. My front door has a Corbin S24 keyed lock and my aunt's has an S31. I have not checked what my parents has yet (as they have no original keys and I haven't dropped by since they asked me about this.) However, finding keys for these old locks is somewhat difficult as none of the locksmiths near us are old-school enough to have even blanks, and certainly don't have any factory precut keys on hand anymore. From disassembling my lock and cleaning it out, I've learned a bit, and from buying random S series keys on eBay and Etsy and modifying them to work, I've learned a bit more, but this forum consistently came up in my research on Google so I figured I'd join. Does anyone have any Corbin S series keys? I am also interested in P, Q, R, H, and other Corbin series, but mostly curiosity only at this point, while S series I have a vested interest in. I would like to compile as much information as I can on these keying series and publish it so that others in our position can make keys for their locks instead of giving up and replacing them with modern locksets. I am most interested in buying keys (specifically S6, S22, S24, and S31 at this point, but all S series accepted - especially if you post pictures and I determine I can machine them to fit S24 or S31) but if you want to keep them in your collections and just post high resolution photos of both sides of the key, that would also help a lot. The deadbolt lock I have seems to be a combination of warded and lever lock designs. It also has an interesting pushbutton lock/unlock mechanism in the mortise and a second, smaller keyhole on the outside only that can be used to lock and unlock the doorknob. I have not removed it from the door in a while but have some cellphone photos of its inner workings if anyone would like me to post them. I am unfamiliar with the P & F Corbin "S" Series but I thought you might be interested in some information that I do have on Corbin bit keys. The "P" Series is extremely common in the Buffalo-Niagara region and there are thousands of homes built in the first half of the last century using these mortise inside locks. Less common are the "R" Series but there are many of them as well. I believe I have encountered "Q" Series as well. I have posted a couple of thumbnails from vintage hardware catalogs that may be of interest. The first is from a now-dufunct local hardware distributor, c.1956, which shows the "P" Series pre-cuts as retailing at $0.25 per dozen at the time. I thought that must be a typo, but DollarTimes Inflation Calculator says $0.25 in 1956 had the same buying power as $2.25 in 2017 so perhaps it was correct? The second is from a Corbin Cabinet Lock Co. catalog c.1960s, a then affiliated company; which shows pre-cut bit keys of the "P" Series, "R" Series, "BQ" Series and "BT" Series which were available from open stock in those days. Some of the after market key blank manufacturers also offered pre-cuts back in the day, I know that both Ilco and Taylor had the "P" Series and that Ilco also made the "R" Series; these are unfortunately all l-o-n-g discontinued. Those two-key mortise front door locks had what was sometimes called a night lock feature. As you described it, one key operated the deadbolt from both sides while a second key opened the latch when the outside knob was locked by the stop buttons. Popular on higher end housing in the late 19th to early 20th century before pin tumbler entrance door locks became common. 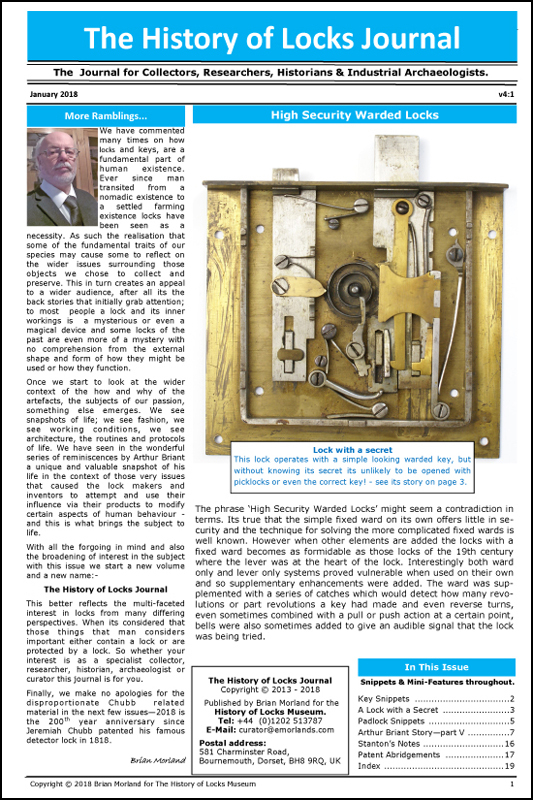 See thumbnail of typical mortise lock case attached. I am also interested in P, Q, R, H, and other Corbin series, but mostly curiosity only at this point, while S series I have a vested interest in. I would like to compile as much information as I can on these keying series and publish it so that others in our position can make keys for their locks instead of giving up and replacing them with modern locksets. Here is a thumbnail image of the P & F Corbin "P" Series bits taken from a c.1937 locksmith supplies catalog. As you can see the 12 variations are accomplished by changing the positions of the side and end ward cuts, while the lever cut remains the same. Thus these locks are easily passed by a "skeleton" key. Thanks for the info on the P series! My apologies on not replying sooner. Information on the S series has been EXTREMELY hard to come by on the internet. None of the old-head locksmith shops in our area that we visited had any info either, even in Worcester. As such my wife and I began collecting keys, with an aim toward collecting the entire S series and others accidentally joining the collection as we bought up cheap lots of mixed keys on etsy and ebay. A few months ago we ended up with 14 or 15 of the series - it turns out there are 36 keys in the S series - and spent some time with them laid out comparing them. We noticed a pattern and extrapolated it to describe the rest of the series and so far, every key's bitting has matched exactly what we predicted. - there are 3 positions of the channel milled into the side of the key "flag". Closest to shaft, centered, and closest to end. - there are 3 positions of the notches cut into the sides of the "flag" as well, which clear the wards in the lock housing. These combine to give 9 permutations. - the channel can be milled on the left or the right side of the "flag". This gives 18 permutations. - the notch/bitting in the end of the "flag" that actuates the spring loaded lever tumbler lock mechanism has two possible depths. This gives the total of 36 permutations. The only logical differences from the P series are that there are 3 channel positions instead of only 2 and the bitting on the end has two depths instead of one. The pattern is similar otherwise. Along the way we also ended up with most of the P series (total of 12 keys, as you showed) and discovered that M series keys are typically used for the night lock feature you described. We also deduced the patterns for the P and M series, which are obviously far simpler than the S series. So we are aiming to complete the M, P, and S series at this point. Others we may or may not collect the entire sets, I'd be fine collecting just enough examples to deduce the bitting and warding patterns and then move on to the next series. At some point I will likely publish the pattern and dimensions/bitting depths so that others can simply buy blanks and cut their keys instead of having to search antique shops and ebay. The patterns are fairly simple... with the exception of the A series! We ended up with two A series keys from a couple of bulk key auctions and man, those are some cool, complicated keys. It appears they have 3 channel positions (plus two faces), 3 warding positions, and 3 lever tumbler lock elements each with 4 bitting depths, for a whopping 1,152 permutations! I'm pretty glad we didn't try to start on that series, we never would have gotten anywhere. you might try bigtreekeys ? the gentleman is on this site and collects folding and keys with changeable heads,he might be able to help you on these keys ? the ones i have are early (1906) flat ,tapered, malable iron and brass. I might have the name wrong,but close. If you browse the older pages here in keys you will find him,hopefully my memory thinks he specializes in these and simular keys ? Last edited by BigTreeKeys; 27-07-18 at 02:53 AM. I took the liberty of making up a diagram showing the correct nomenclature for the various "parts" of a bit key, please see pdf attached.